I have 2 children. I have worn the glorious badge of parenting honour, that is the eye bag for 4 years now. It’s a strong look. Sometime I accessorise it with an inside out cardigan, sometimes I select the unbrushed hair to really emphasise its glorious simplicity. I have been known to apply half a tube of Touché Eclat and genuinely believe I look passable (until catching sight of my reflection in a shop window and mistaking myself for a bag lady). There have been more sleepless nights than I would care to remember, but now I am hopeful that we are coming out the other side of this. The children are growing up. They are 2 and 4 and although they mostly don’t sleep through the night, occasionally they do. My sleep is probably disturbed about 4 nights a week by a lost bedtime item. My daughter now has her favourite comforter attached to her wrist with a small ribbon each night because it seemed like a more socially acceptable solution than super-glueing it to her face. But that means about 3 nights a week with no small people disturbances. So now the little sleep thieves are finally cutting us some slack, I have done what all good mothers do and I have invented a selection of utterly ridiculous thoughts which get into my head and steal my sleep instead. Here are a selection of things I have genuinely lost sleep to. The size of my children’s feet. They are clown-like in their proportions. I don’t worry so much about my son – he will wave his around with pride. They will be discussed with a wry smile and cheeky wink. Its my daughter that worries me. I fear she will be buying her shoes from specialist shops for drag queens. People will stare. I worry. That my daughters teacher thinks I am an unfit mother. I am generally accompanied on the school run by a screaming toddler, who I absent mindedly hand random food items to so he can either eat them or launch them at other children. I forget homework. I forget to send an item for show and tell. Maybe from this she has deduced that there is nothing fun in our lives to show or tell about. She probably thinks I tether the children to a stake in the garden and get drunk all weekend. It would explain my appearance…..
Christmas. This concerns me from about October onwards. It hangs around, skulking in the background of my thoughts and fears. I worry that I will entirely forget to send cards out. I am concerned that I will forget to buy a present for Auntie Maud and she will be forced to have the emergency box of York Fruits and a boring candle that you always save for such occasions. I worry that the children will behave like spoilt brats, that they will say something ungrateful about an inappropriate toy purchase made by a well meaning relative who doesn’t really know them. That I have forgotten something. This could be that I have forgotten to do my daughters reading, that I forgot to lock the back door, that I forgot to buy a card for someone’s birthday, that I forgot to send a tin of something random for harvest festival, that I forgot to send the children looking presentable on photo day, that I have left the hair straighteners on. It could be anything, I cant even remember the list of things that I have failed to remember. And the killer. I lie in bed, and I worry that I will still be worrying about nothing at 3am. And that once I finally get to sleep, that one of the sleep stealers will wake me up again. That I will spend the next day grumpy and tired because I haven’t had enough sleep. And that worry keeps me up till 3am. My four year old won’t stop eating and is now in size 7 clothes. I think I’m raising a future giant. Oh yes, lets get involved in a support group! I might start worrying about how to organise it! Why do we do it to ourselves? I didn’t sleep for a week before my sons first sleepover with my Mum and Dad as I convinced myself he was going to choke on a button. I have no idea why. My Mum doesn’t collect buttons or anything. She just has an ordinary amount of buttons in her home! 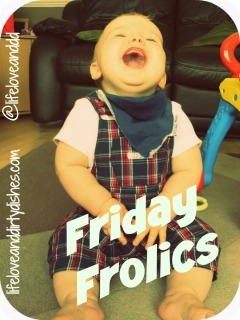 Thanks for linking up to #Friday Frolics. Hope to see you again next week. always lovely to join in hostess with the mostess!